Win your sweetie’s heart with a scrumptious Valentine’s Day dessert. Whether she likes rich chocolate desserts, crème brulee, or berry pies, no dish is as romantic and passionate as desserts. Here are some Valentine’s Day dessert recipes that both of you can share on this day. 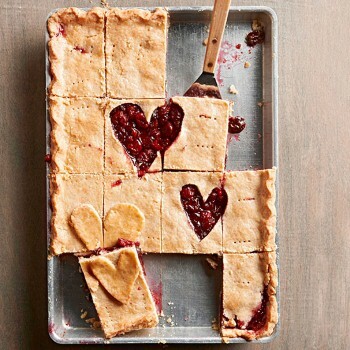 Double Cherry Slab Pie – Charm your girl with thick cherry filling on this Valentine’s Day. Incorporate cornflakes with cherries for the gooey and dreamiest filling. 1. In a large mixing bowl combine the flour, the 2 Tbsp. sugar, and salt. Using a pastry blender, cut in the shortening and butter un til pieces resemble small peas. 2. Sprinkle 1 Tbsp. of the ice water over part of the flour mixture; toss with a fork. Push moistened flour mixture to side of bowl. Repeat moistening flour mixture, using 1 Tbsp. of water at a time, until flour mixture is moistened. Gather flour mixture into a ball, kneading gently until it holds together. Divide into 2 uneven balls; one ball should contain two-thirds of the pastry. Cover; set aside. 3. In a large mixing bowl combine frozen cherries, dried cherries, 1 cup granulated sugar, the cornflakes, and lemon peel. Set aside. 4. Preheat oven to 350 degrees F. Place larger ball of pastry between two pieces of lightly floured waxed paper. Roll to a 17×12-inch rectangle. Remove top piece of waxed paper. Carefully invert pastry into a 15x10x1-inch baking pan. Peel off waxed paper. Press pastry up sides of pan. 5. Spoon filling evenly over pastry. Roll remaining pastry to a 16×11-inch rectangle between 2 pieces of lightly floured waxed paper. Remove top sheet of waxed paper. Using a 3-inch heart-shape cutter, cut hearts out of pastry; set aside. Invert pastry over filling. In a small bowl whisk together egg white and 1 Tbsp. water. Brush pastry with egg white mixture. 6. Bake for 45 minutes or until golden brown. Cool completely in pan on wire rack. 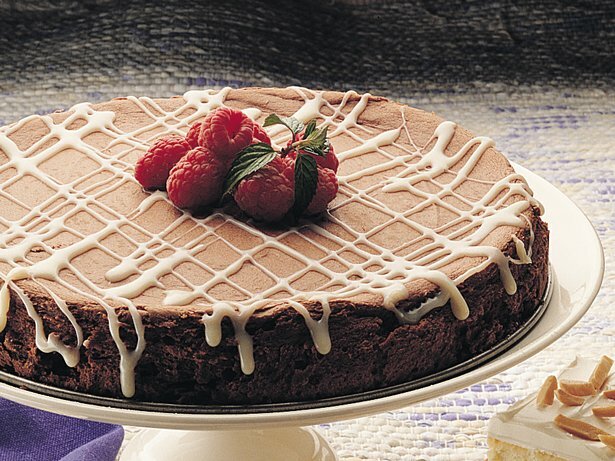 Chocolate tart - Treat your Valentine to a sinfully delicious chocolate tart topped with juicy raspberries. 1. Place the butter, flour, icing sugar, almond meal and cocoa powder in the bowl of a food processor and process until mixture resembles fine breadcrumbs. Add the egg yolk and process until mixture just comes together. Turn onto a lightly floured surface and gently knead until almost smooth. Shape into a disc. Cover with plastic wrap and place in the fridge for 30 minutes to rest. 2. Preheat oven to 200°C. Roll pastry on a lightly floured surface to a 4mm-thick disc. Line the base and side of a 23cm (base measurement) round, fluted tart tin with removable base. Use a sharp knife to trim the edges. Place in the fridge for 15 minutes to rest. 3. Place the tart tin on an oven tray. Line the pastry with baking paper and fill with rice or beans. Bake in preheated oven for 10 minutes. Remove the rice or beans and bake for a further 5 minutes or until pastry is just cooked through. Reduce oven temperature to 160°C. 4. Meanwhile, to make the filling, combine the yolks, custard powder and sugar in a saucepan. Add the chocolate, cream and milk and place over low heat. Cook, occasionally whisking with a balloon whisk, for 5 minutes or until chocolate melts and mixture is smooth. Remove from heat. 5. Pour the chocolate custard mixture into the pastry case. Bake in oven for 20 minutes or until custard is just set. Remove from oven and set aside to cool completely. Place in the fridge to chill. Bittersweet Chocolate Cheesecake with White Truffle Sauce – You’ll love this cheesecake–it’s full of rich (but not too sweet) chocolate flavor! 1. Heat oven to 275°F. Lightly grease bottom and side of 9-inch springform pan. In medium bowl, beat cream cheese and vanilla with electric mixer on medium speed until smooth. Gradually add sugar, beating until fluffy. Beat in flour. Beat in eggs, one at a time. Beat in chocolate. Pour into pan. 2. Bake about 1 hour 15 minutes or until center is set. (Do not insert a knife because the hole could cause cheesecake to crack.) Cool at room temperature 15 minutes. 3. Run knife around side of pan to loosen cheesecake. Cover and refrigerate about 3 hours or until chilled. 4. In 2-quart saucepan, melt white chocolate and butter over low heat, stirring constantly (mixture will be thick and grainy); remove from heat. Stir in whipping cream until smooth. Cover and refrigerate about 2 hours or until chilled. 5. Run knife around side of pan to loosen cheesecake; remove side of pan. Let cheesecake stand at room temperature 15 minutes before cutting. Serve cheesecake with sauce and berries. Store in refrigerator. 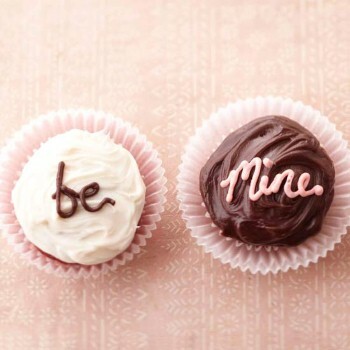 Love Note Cupcakes – Scrawling a love note in frosting is a sweet way to celebrate Valentine’s Day. Start with a mix for German chocolate cupcakes, and top off the dessert with one (or all!) of our three frosting recipes. 1. Line twenty-four 2-1/2-inch muffin cups with paper bake cups. Set aside. 2. Preheat oven to 350 degrees F. Prepare cake mix according to package directions, except use a mixture of the red food coloring and water to equal the amount of water called for in the package directions. Fill muffin cups and bake as directed for cupcakes. Cool cupcakes in muffin cups on wire racks for 5 minutes. Remove cupcakes from muffin cups. Cool completely on wire racks. 3. Spoon White Chocolate Whipped Cream into a pastry bag fitted with a large round or star tip. Push tip into the top of each cupcake and force some whipped cream inside cupcake. 4. Frost cupcakes with some of the white Mascarpone Frosting, pink Mascarpone Frosting, or Chocolate Buttercream. Place the remaining frostings in separate pastry bags fitted with writing tips or small star tips. Pipe messages or draw hearts onto cupcakes. Cover loosely and chill to store. Makes 24 (2-1/2-inch) cupcakes. 1. In a very large mixing bowl beat butter with an electric mixer on medium speed until smooth. Beat in cocoa powder. Gradually add 2 cups powdered sugar, beating well. Slowly beat in 1/2 cup milk and anilla. Gradually beat in an additional 6 cups powdered sugar. Beat in additional milk, 1 tablespoon at a time, as needed to reach spreading consistency. Makes enough to frost tops and sides of two 8- or 9-inch layers. 1. In a large bowl, combine mascarpone cheese and softened butter. Beat with an electric mixer on medium to high speed until smooth. Beat in vanilla. Gradually add powdered sugar, beating well. Beat in milk, 1 teaspoon at a time, to reach spreading consistency. 1. 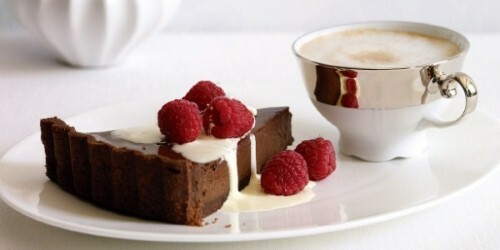 In a small heavy saucepan, combine white baking chocolate and 1/4 cup of the whipping cream. Cook and stir over low heat until chocolate is nearly melted. Remove from heat; stir until smooth. Cool for 15 minutes. In a large bowl, beat remaining whipping cream with an electric mixer on medium speed until soft peaks form (tips curl). Add the cooled white chocolate mixture. Beat just until stiff peaks form (tips stand straight). If desired, cover and chill for up to 24 hours. 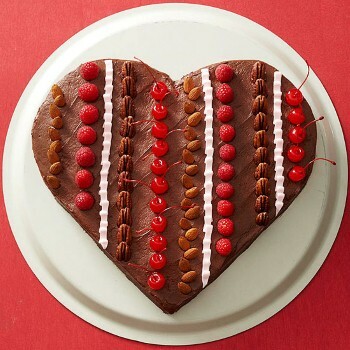 Red Velvet Heart Cake – Bake a heart-shape cake for your sweetheart on Valentine’s Day. Rows of almonds, raspberries, maraschino cherries, and icing stripe this chocolate-frosted red velvet cake for a sweet and romantic treat. 1. Preheat oven to 350 degrees F. Grease and lightly flour one 8x8x2-inch square baking pan and one 8×1 1/2-inch round cake pan. Set aside. Prepare batter for Red Velvet Cake as directed. Divide batter between the prepared pans so batter is the same height in each pan (square pan will require more batter). Bake for 25 to 30 minutes or until a wooden toothpick inserted in centers comes out clean. Cool cake layers in pans on wire racks for 10 minutes. Remove layers from pans; cool completely on wire racks. 2. Using a long serrated knife, trim rounded tops of cake layers flat. Cut round cake layer in half crosswise, making two half-circles. On a large flat serving platter or tray place half-circles next to adjacent sides of square cake, making a heart shape. 3. Transfer about 1 cup of the Chocolate-Sour Cream Frosting to a small bowl. Stir in milk to thin frosting. Spread thinned frosting in a very thin layer over top and sides of cake. Let stand about 30 minutes or until set. Spread the remaining chocolate frosting over top and sides of cake. Smooth top with a long metal spatula. 4. Arrange maraschino cherries, raspberries, almonds, and pecans in separate rows on top of cake. If using, tint Creamy White Frosting pink with red food coloring (if desired). Transfer to a decorating bag fitted with a ribbon tip or other tip; pipe in rows on top of cake. Store cake, covered, in the refrigerator. Place maraschino cherries on a double thickness of paper towels to blot dry. In a large saucepan melt chocolate pieces and butter over low heat, stirring frequently. Cool for 5 minutes. Stir in sour cream. Gradually add powdered sugar, beating until smooth. This frosts tops and sides of two 8- or 9-inch cake layers.